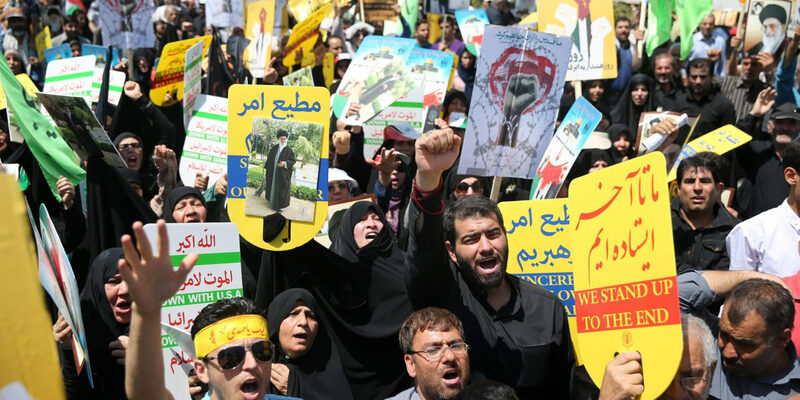 Iran’s regime, including President Rouhani and the Foreign Ministry, are calling for a mass demonstration by Iranians on Friday against Israel and in defense of the Palestinian people. Friday is Quds Day, commemorated since the Islamic Republic’s creation in 1979, with rallies over Israeli control of Jerusalem (al-Quds) and the wider Israeli-Palestinian conflict. Rouhani added that the “Zionist regime” of Israel is trying to provoke clashes among Islamic countries to diver cover up its crimes against the Palestinian people. The Zionist regime’s planned attempts to fully Judaize al-Quds and to destroy its historical and civilizational identity, the regime’s settlement activities, its raids on the al-Aqsa Mosque, and desecration of its sanctity…have created a dire situation. Al-Aqsa is on the Temple Mount, a site which is considered holy by both Jews and Muslims. It has been the scene of frequent clashes between Israeli security forces and Palestinians. The Foreign Ministry declared that Quds Day would show “support of the people of Palestine and Palestinian resistance groups in the path of unity against the Zionist regime”. Deputy Industry Minister Valiollah Afkhami Rad has said that Iran needs $800 billion to spur economic recovery after years of recession and stagnation. He added that Iran’s financial system and “investment climate” need essential reforms to improve productivity. Amid sanctions and mismanagement, Iran’s economy contracted 4.6% in 2013. Under the Rouhani Administration, GDP has shown little or no growth. However, January’s implementation of the July 2015 nuclear deal, with the lifting of some US and European sanctions and a renewal of Iran’s oil exports, has brought hope of expansion in 2016-17. Immediately after the deal, Rouhani announced multi-billion-dollar deals with France and Italy for investment in key sectors such as the automotive and energy industries. However, the effort has been hampered by continuing US sanctions, by the Supreme Leader’s warning against engagement with the “West”, and by the Revolutionary Guards’ detention of businessmen who are foreign nationals as well as Iranian citizens. Iran’s target is in the context of only $28 billion in “greenfield” projects — new production facilities, distribution hubs, offices, and living quarters — by foreign companies since 2003. Iran’s automotive industry attracted just one project per year between 2010 and 2015. There were just two projects in the metals sector between 2010 and 2015, after 18 projects between 2003 and 2009. In the coal, oil, and natural gas sector, capital expenditure on new projects by foreign companies was just $3.15 billion from 2010 to 2015.